Originally published on April 16, 2012. Jason Inman (Sh*t Comic Book Nerds Say) is joining Don and Jerry to review a new stack of books—and this week has brought another smorgasbord of new titles and mini-series. Are they good? Are they bad? Well folks, they run the gamut in our eyes. After the review we spend some time reflecting on the New 52 now that we’re seven months in and discuss the latest news out of C2E2. 00:02:24 Jason introduces himself and shares our Secret Origin. 00:14:36 The boys pontificate on the success of The Avengers and The Dark Knight Rises. 00:23:40 What was missing from the recent Eisner nominations? A bit too much. 00:29:30 Avengers vs. X-Men #1: Don is on an island by himself with his enjoyment of AvX. 00:38:01 Avengers vs X-Men #1 Infinite: Every book could use a little more infinite. 00:44:11 America’s Got Powers #1: Jerry and Jason dug this new mini while Don felt the material was too familiar. 00:53:07 Secret Service #1: We all agreed that Mark Millar has done better. 00:57:35 Invincible #90: Read this book turkey! 01:04:04 Rich Johnston’s Iron Muslim #1: Nobody’s in on the joke. 01:08:33 Fanboys vs. Zombies #1: We’re all in on the joke, but only Jerry’s laughing. 01:13:04 Bionic Woman #1: It’s time for Dynamite to rethink its Bionic franchise. 01:19:06 Danger Club #1: We’re all on board for this new series with a ton of potential. 01:24:14 Secret #1: Don is back on his island again. 01:29:06 Supreme #63: Secret was supposed to be confusing. What’s your excuse Supreme? 01:37:51 Avenging Spider-Man #6: Mark Waid and Greg Rucka start their crossover off with perfection. 01:43:29 Saga #2: Jerry and Jason feel that the book was over too quick, but we’re all agreed that this is a perfect series. 01:51:19 We discuss creator-owned comics. 01:56:01 What are we loving seven months into the New 52? 02:08:07 Marvel is ready to return Gambit to his own series. 02:11:02 Gambit may not excite us, but we’re all over Hawkeye. 02:13:35 Can a meeting between Peter Parker and Miles Morales work? 02:19:53 Ultimate Cap is returning to the Ultimate books. 02:23:27 We share more thoughts on Before Watchmen. 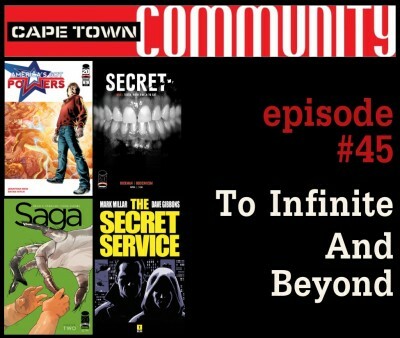 02:26:58 Where will Brian Michael Bendis find himself after his Avengers run? 02:31:59 Mark Waid announces his exciting own new digital initiatives.